In some cases, one surgery alone isn’t enough to fix a foot or ankle problem. It’s possible that the original surgeon made mistakes, or that the medical condition recurred after the surgery. One example is when complications occur with foot surgical hardware. A podiatrist in Sugar Land may need to remove surgical plates, screws, or rods because of these complications. During this revision surgery , the foot surgeon may also correct other anatomical problems. Podiatrists differ in opinion as to whether surgical hardware should be routinely removed, even when it isn’t causing any problems. Once the area has healed, and the hardware has fulfilled its function, there’s no need for it to remain. Some foot specialists prefer to remove it preemptively before it potentially causes complications. Others prefer to leave surgical hardware in place, due to the risks inherent with a subsequent surgery. Infections at the surgical site are one reason why a foot doctor would remove the hardware. During the revision surgery, debridement to remove the infection may be necessary. Some patients are sensitive to certain metals, such as nickel, cobalt, and chromium. It’s possible to have an adverse immune response to surgically implanted hardware. It’s uncommon, but possible for metal hypersensitivities and allergies to result in the breakdown of bone tissue and the loosening of the hardware. In some cases, revision surgery to remove the hardware is necessary because the original procedure failed to correct the problem. “Non-union” is the medical term for the incomplete healing of the bone after surgery. During the revision surgery, the podiatrist may need to stabilize the area further, such as by using bone grafts or different surgical hardware. Morton’s toe gets its name from the first orthopedic surgeon to officially describe the condition—Dudley Morton. If your second toe is longer than your big toe, then you have Morton’s toe . Usually, this congenital condition doesn’t cause any problems. If yours does, a foot specialist in Sugar Land can give you the expert guidance you need. Podiatrists tend to recommend nonsurgical treatment options before considering surgery. Your foot has five long bones that connect each toe to the midfoot. These bones are called metatarsals. Your big toe is connected to the first metatarsal, and your second toe is connected to the second metatarsal, and so on. Morton’s toe doesn’t involve an anatomical abnormality with the second metatarsal, but rather with the first. If the first metatarsal is shorter than usual, then the big toe will be shorter—consequently, the second toe looks longer than it should be. Many people with Morton’s toe never see a foot doctor for this condition, as it doesn’t always cause symptoms. In severe cases, Morton’s toe can cause changes in the way a person walks. This imbalance results in excess pressure placed on the second toe or the ball of the foot. The complications that can occur from changes in gait can range from calluses and corns to hammertoes. Hammertoes are characterized by the bent position of the toes. Initially, it’s possible to stretch out hammertoes. Over time, the muscles tighten to the point at which they cannot be manually flexed. If hammertoes become permanent, corrective surgery may be needed. Most patients with Morton’s toe will do well with a change in footwear. Foot doctors recommend wearing comfortable shoes that feature a wide, deep toe box. This will give the toes plenty of space. You may also need metatarsal pads, or custom orthotic inserts to achieve proper foot alignment. If Morton’s toe is causing significant problems, and a change in footwear isn’t enough, a foot surgeon may perform a surgery that involves shortening the second metatarsal bone. This is an outpatient surgery, during which the doctor will excise a small portion of the bone, and then use surgical hardware to hold the ends of the bone together as they heal. You might be familiar with the carpal tunnel, which is the narrow passageway located at the wrist. The tarsal tunnel is a similar, narrow space, but it’s located on the inside of the ankle. This structure houses blood vessels, tendons, and nerves, including the posterior tibial nerve. Just like carpal tunnel syndrome, tarsal tunnel syndrome involves the compression of the nerve when there isn’t sufficient space within this area. Since this condition can worsen, patients would be wise to contact a foot specialist near Sugar Land. A podiatrist may recommend nonsurgical treatments or surgical intervention to restore the function of the foot and ankle. The compression of the posterior tibial nerve can cause tingling, which is often described as a pins and needles sensation. Numbness and burning or shooting foot pain also indicate nerve damage. These symptoms may develop suddenly for no apparent reason, but they can also develop after overuse of the foot from prolonged standing or exercising. The underlying cause of tarsal tunnel syndrome is the pressure exerted on the posterior tibial nerve. The nerve can be compressed when the tarsal tunnel is narrower than usual, which can occur when there is swelling and inflammation in the area. Diabetes and arthritis are risk factors for tarsal tunnel syndrome because they can both cause inflammation that narrows this space. An injury, such as an ankle sprain, can have a similar effect. Other patients may develop tarsal tunnel syndrome because of an abnormality that takes up space in the area, such as a ganglion cyst, bone spur, varicose vein, or swollen tendon. Flatfoot is another risk factor of tarsal tunnel syndrome, as fallen arches cause the heel to tilt outward, which can compress the area. Apply ice packs for 20 minutes at a time. Take nonsteroidal anti-inflammatory drugs (NSAIDs). Wear a cast or brace to immobilize the foot. Receive injections of anesthetic and/or steroid medicines. Use custom orthotic devices and supportive shoes. If these nonsurgical treatments aren’t enough to relieve symptoms and heal the area, the podiatrist might recommend surgical intervention. Bunions: How Are They Treated? Bunions are bony, outward protrusions at the base of the big toe. This bump develops when the big toe bends abnormally inward, toward the other toes. Patients may experience pain, which can be severe enough to make wearing shoes a challenge. Since this medical condition can worsen without the proper treatment, bunion specialists in Sugar Land urge patients to schedule an appointment sooner, rather than later. Bunions are most easily treated when they are detected early. Improper footwear is a major risk factor for foot health problems like bunions. One of the simplest, nonsurgical treatments is to avoid wearing very tall high heels and shoes with a narrow toe box. If you find it difficult to give up your high heels, and you typically sit most of the day at work, consider wearing athletic shoes into the office. Bring your high heels with you and swap footwear when you arrive at work. When you choose footwear with plenty of room in the toe box, you’ll have enough space to add extra padding. Your podiatrist can demonstrate how to place the padding for best results. The doctor can also show you how to tape your foot to prevent abnormal movements, which relieves pressure and pain. Applying ice packs can be helpful if the bunion becomes painful, inflamed, and swollen. Cover an ice pack in a thin towel and place it on the foot for no more than 20 minutes at a time. You can do this several times per day to relieve the pain and suppress the swelling. Some patients with bunions can attain sufficient relief of their symptoms with over-the-counter nonsteroidal anti-inflammatory drugs (NSAIDs). Otherwise, the podiatrist may provide a prescription. Injected anti-inflammatory drugs are another possibility. Therapeutic ultrasound won’t correct the deformity. However, it may help relieve the pain and the swelling of the soft tissues in the area. Surgery is the only way to correct the deformity, rather than simply manage the symptoms. This may be a good option for you if your symptoms are severe and nonsurgical treatments aren’t helping enough. To reduce the risk of bunion revision surgery later on, you should carefully follow the doctor’s post-operative instructions. You may already know that most of the bones in your body are attached to other bones with strong, fibrous bands of tissue called ligaments. But did you know that there are a few exceptions? The underside of the forefoot features two very small bones, about the size of a kernel of corn. These are sesamoid bones and they are surrounded by tendons, rather than ligaments. Sesamoiditis is a type of tendinitis that involves the inflammation or irritation of these tendons. If you’ve been suffering from foot pain, consider seeing a podiatrist in Sugar Land to find out if you could have sesamoiditis or another podiatric condition. Sesamoids have sometimes been called the pulleys of the feet. They allow the tendons to slide over the smooth surface of the bone to allow for muscle movements. Like any other bone, it is possible for the sesamoids to sustain a fracture due to physical trauma. It’s also possible for the tendons to become inflamed and painful due to repetitive strain. That’s why this type of tendinitis is most common among ballet dancers and other avid athletes. Pain is the primary symptom of sesamoiditis. If you have this podiatric problem, you’ll notice that the pain is localized under your big toe toward the ball of the foot. 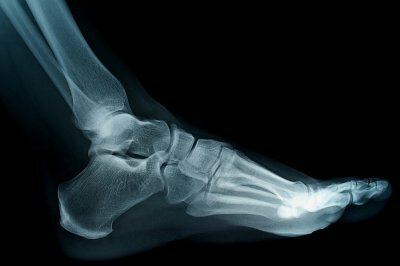 The discomfort of sesamoiditis tends to develop over time, whereas a fracture of the sesamoid bone triggers acute pain. The pain may increase when you attempt to bend and straighten the big toe. The range of motion may be limited. It’s possible for swelling and bruising to develop, although this doesn’t occur in every case. When you visit a podiatrist, your appointment will include a physical exam. The podiatrist may move the toe or ask you to bend and straighten it. X-rays can be helpful in confirming a sesamoid fracture. In some cases, a podiatrist may request blood tests to rule out other possible causes such as gout and arthritis. Conservative treatment options are usually effective for treating sesamoiditis. Your podiatrist will recommend that you rest from physical activity, apply ice packs, and wear cushioning footwear. You may be advised to take a nonsteroidal anti-inflammatory drug (NSAID) or the podiatrist may inject an anti-inflammatory directly into the area. When your feet hurt, everyday tasks can become challenging and uncomfortable. If you’re suffering from foot pain in Sugar Land, consider seeing a podiatrist right away, so your symptoms can be diagnosed and treated. Neuromas, which are also called pinched nerves or nerve tumors , are a source of foot pain that also cause burning sensations, numbness, or tingling in between the toes in the ball of the foot. This painful condition can result from several causes. The natural shape of your foot can result in the development of a neuroma. 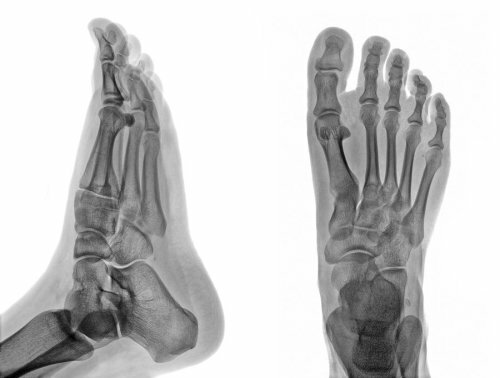 Biomechanical deformities such as bunions, hammertoes, flat feet, or a high-arched foot can lead to instability in the vicinity of the toe joints and put an individual at a higher risk for developing neuromas. If you have been diagnosed with flat or high-arched feet, ask your podiatrist about orthotic foot inserts that can offer your feet the support that they need and potentially prevent neuromas. Similarly, seek treatment for bunions and hammertoes to improve your foot health and help to avoid this painful condition. People who have occupations that force them to spend long hours standing may develop neuromas due to the repeated stress that is placed on their feet. Also, high-impact athletic activities can subject your feet to repeated trauma and lead to neuromas. Some examples include rock climbing, snow skiing, and running. If you spend a lot of time on your feet or participate in athletics, ask your podiatrist about the best footwear to help keep your feet pain-free. Shoes that place pressure on your toes or force extra weight onto the ball of your foot can lead to the development of neuromas. To help avoid this, do not wear high heels or shoes that are ill-fitting. Instead, choose shoes that provide plenty of space in the toe box, include buckles or laces that allow you to adjust their snugness, have supportive insoles, and offer plenty of shock-absorbent cushioning in the sole. Flat feet are feet with low arches, usually caused by a muscle imbalance. This hereditary condition can cause leg pain, foot and leg fatigue, bunions, hammertoes, and more. Although some cases of flat feet can be effectively treated with orthotics and non-invasive treatment options, severe cases usually require surgery. If you have flat feet in Houston , your foot doctor may recommend surgical correction to alleviate your symptoms and prevent future complications. Here is a look at what you can expect. Your foot and ankle specialist may suggest surgery if the symptoms caused by your flat feet, such as ankle pain, are interfering with your daily life and non-invasive treatments have not helped. For flatfoot surgery to be effective, the arch of the foot must be flexible rather than stiff. Before surgery, your foot doctor will also consider your overall health to ensure that you don’t have any conditions that could make anesthesia unsafe or interfere with your recovery. Flatfoot surgery is performed under general anesthesia or using regional anesthesia, such as a spinal block. There are several different methods your surgeon can use, each of which allows your doctor to reconstruct your foot to increase the arch. During some procedures, bone deformities are corrected, while the ligaments and tendons are repaired in others. Your foot doctor will determine which approach is best for you based on your symptoms and the structure of your foot. What Happens During the Recovery? Most patients go home the same day of the procedure, though an overnight hospital stay may be necessary. For the first two weeks, the leg will be in a cast and must be kept elevated. After that time, the sutures are removed, and patients receive a removable boot. You cannot put any weight on the foot for six to eight weeks, or until cleared by your surgeon. Around 12 weeks after surgery, patients may be able to wear normal shoes using a foot or ankle brace. Complete recovery may take up to a year, and physical therapy may be necessary. If you are in need of a foot doctor in Sugar Land, TX , visit Advanced Foot & Ankle Specialists or call 281-242-3338. What Procedures Are Commonly Performed During Reconstructive Foot Surgery? Foot surgeons, podiatric physicians, or foot and ankle specialists perform reconstructive foot and ankle surgeries for a number of different reasons. The purpose of surgery is typically to relieve the pain, inflammation, and discomfort that may be caused by an injury, arthritis, congenital abnormalities, or infection. Reconstructive surgery should also restore function and mobility. Here are some common surgical procedures that may be performed by a foot doctor in Sugar Land . Bone fusions are generally used to treat rheumatoid arthritis of the foot or ankle. A bone fusion procedure is performed in the course of a foot surgery. 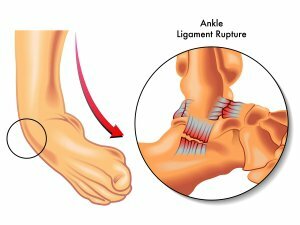 The foot surgeon removes all of the cartilage from the joint, and then fuses the two joint bones together with pins, plates, or screws, so that they cannot move. A bone osteotomy is a surgical procedure in which a foot specialist removes or cuts away at the bones of the foot in a very precise manner. This surgery is performed as part of bunion treatment, heel spur treatment, and hammertoe treatment. Bone grafting is a procedure in which human bone or synthetic bone is used to replace bone that has deteriorated due to disease or injury. Tendon surgery is used to repair severe injuries, or to lengthen or shorten the tendon. Tendons can also be re-routed to improve the function and mobility of the foot and ankle. For those who suffer from flat feet, the ligament that supports the arch of the foot can become stretched out and even torn. 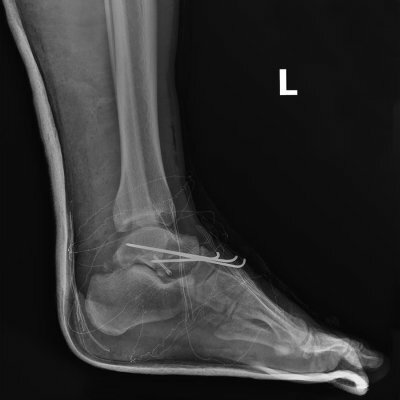 A foot specialist can repair this ligament in surgery by rerouting other tendons to help support the arch of the foot. It is very common for injuries to occur to the skin or soft tissue of the feet. Depending on the type of injury and the severity, your foot doctor may recommend surgery. Conditions that may benefit from skin or soft tissue are fungus on the feet, wart removal, and ganglion cysts.